With an orbital mission and a circumlunar mission under his belt, Chris is by far the most experienced astronaut available. That does not mean the mission to the Lunar surface is his by default. The US has their own candidate, Morrison Kant. Chris must accept that the job may go to the American, who compounds the offence by being an all-round splendid fellow whom Chris cannot dislike. Chris comes to terms with the expected loss of mission … but wait! Kant breaks his leg. Chris will be going to the Moon after all. Behind the Iron Curtain, an arduous series of tests winnows a pool of highly qualified young men down to one determined idealist, Serge Smyslov. Utterly convinced of the righteousness of the Communist way, Serge is willing to die if it’s necessary to further the interests of the Soviet Union and humanity. He’s also willing to kill, if it comes to that. East and West launch their ships within hours of each other. Following virtually identical paths to the Moon, the two craft reach that desolate world almost simultaneously. Once down, the two missions follow very different strategies: Chris sets out to recover material from the domes, while Serge sets out in his lunar tank to ensure that the imperialists do not claim the Moon for their own. Chris returns with his precious sample only to discover that in his absence his rocket has been holed. It’s utterly disabled. He has only hours to live before his oxygen runs out, hours that he spends searching for evidence that his rocket was deliberately holed. The evidence is easy enough to find: the recoil from the tank gun flipped over the tank. It’s trapped like a turtle on its back. The tank is gefucktet and the Russian inside is as doomed as Chris. Serge and Chris will both die unless they can find a way to work together. Three books into the series and U.N.E.X.A is still nowhere to be seen. It’s odd. I read most of the U.N.E.X.A books when I was a kid (Waterloo Public Library had an almost complete set) and yet I’d forgotten the whole Domes of Pico plot, which dominates the series thus far and probably will continue to do so for a few more books. Hmmm. I think I would have remembered aliens bathing the Earth in deadly radiation. Speaking of radiation: Chris has been exposed to lots and lots, which makes me wonder if he lived long enough to retire1. In Serge’s defence, his Red masters deliberately issue vague orders they know he will interpret as directing him to attack the joint US-British-French-German rocket while leaving the SU with plausible deniability. A lot of effort has gone into properly indoctrinating the young Russian to ensure he will attempt cold blooded murder if necessary. Serge becomes one of the continuing characters in the series. You would think that attempted murder might kibosh further cooperation but the guys handle this in red-blooded he-man fashion: on their way home to Earth they square off and Chris does his best to beat the tar out of Serge. Not a great idea to have an all-out fight in a fragile spacecraft…. Part of Walters’ goal was to write scientifically plausible adventure stories (despite which telepathic twins showed up later in the series) so his rockets are chemical rockets and the trip to the Moon takes several days. Having read later books I can see the author laying the ground work for subsequent novels about long-range exploration carried out with comparatively modest rockets. To save on life-support needs, the plan is to keep Chris in a stupor for much of the trip, a strategy that develops into hibernation. Operation Columbus is short and to the point. None of the big questions about the Domes are answered. Such conflict as does exist is purely due to the needless squabble between East and West over who will claim the Moon for their own. 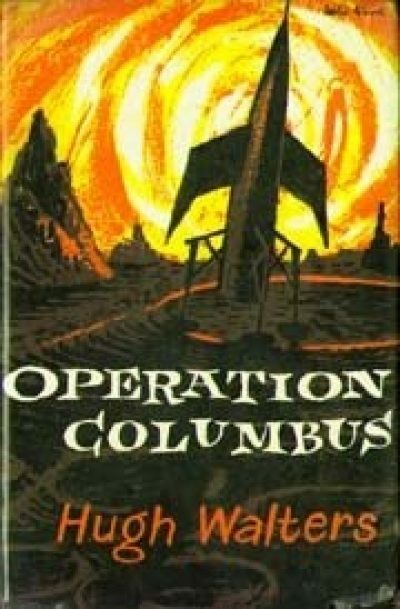 Operation Columbus is thoroughly out of print. 1: One of the supporting characters is still recovering from grave injuries suffered in an earlier book. Invalids are treated as very nearly totally incapable in this series. Even through there is nothing wrong with his mind, he has to strenuously insist on being allowed to participate in planning sessions.